The 10 Baht banknotes have 4 types that were printed from Thomas dela Rue and the Royal Thai Survey Department. 10 Baht Royal Thai Survey type 1 new spelling Thai Government and have small text Royal Thai Survey both front and back. 10 Baht Royal Thai Survey type 2 wavy lines watermark and print the constitution on pedestal tray at the lower right circle. Thomas type 1 ordinary number signature Pradid UNC about 33,000 - 34,700 baht. Thomas type 1 ordinary number signature Pradid EF about 21,200 - 22,300 baht. Thomas type 1 ordinary number signature Pradid VF about 8,500 - 9,000 baht. Thomas type 1 solid number xxxxxx signature Pradid F about 28,300 - 29,700 baht. Thomas type 2 ordinary number signature Pradid UNC about 35,400 - 37,200 baht. Thomas type 2 ordinary number signature Pradid VF about 4,000 - 4,200 baht. Thomas type 2 ordinary number signature Pridi EF about 21,200 - 22,300 baht. 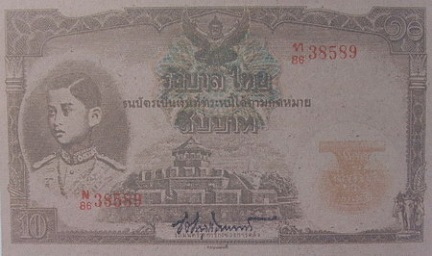 Royal Thai Survey type 1 ordinary unmber signature Pao UNC about 39,000 - 41,000 baht. 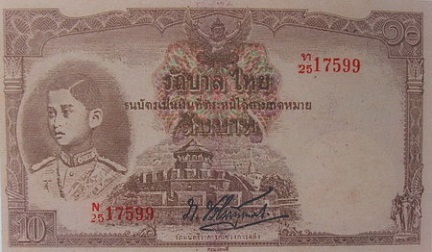 Royal Thai Survey type 1 ordinary unmber signature Leng UNC about 21,200 - 22,300 baht. Royal Thai Survey type 2 ordinary unmber signature Direk EF about 23,600 - 24,800 baht. Royal Thai Survey type 2 ordinary unmber signature Wijit VF about 35,400 - 37,200 baht. 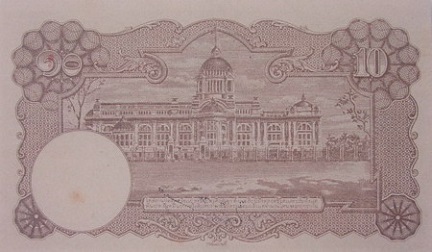 The 4th series 10 Baht Thomas type 1 banknotes were announced on 12th June 1939. 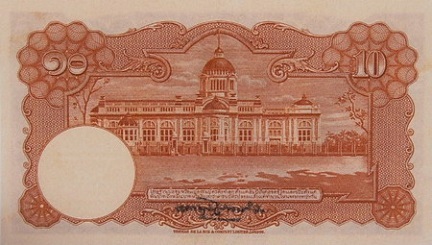 The 4th series 10 Baht Thomas type 2 banknotes were announced on 7th Marchr 1939. 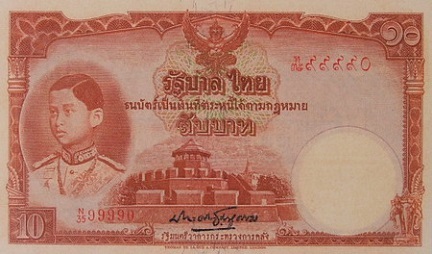 The 4th series 10 Baht Royal Thai Survey type 1 banknotes were announced on 24th May 1943. 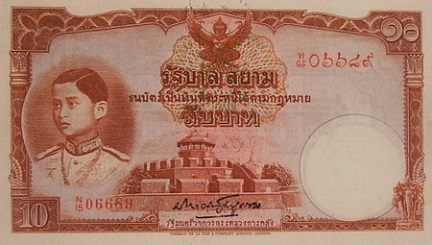 The 4th series 10 Baht Royal Thai Survey type 2 banknotes were announced on 5th April 1945. The main object is the image of King Rama 8 on the left. The middle image is the Mahakarn Fortress. The serial code and number were printed with red ink.